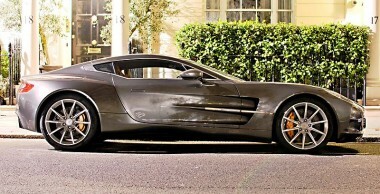 There was a limited run of 77 cars, giving part of the name of the One-77. The One-77 features a full carbon fibre monocoque chassis, a handcrafted aluminium body, and a naturally aspirated 7.3 litre (7312 cc) V12 engine with 750 hp (560 kW). Aston Martin claims it is the most powerful naturally aspirated production engine in the world! The top speed was estimated to be 200 mph (320 km/h) but actual tests in December 2009 showed a figure of 220.007 mph (354.067 km/h), with a 0–60 mph time of approximately 3.5 seconds. We are very fortunate enough to have the only one in Australia, located right here in Brisbane.